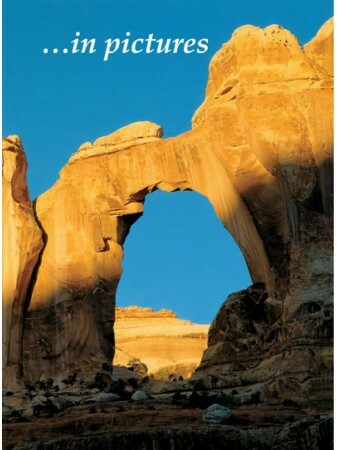 Experience everything Arches and Canyonlands National Parks in Utah have to offer.Delicate Arch, Island in the Sky, the Maze, Balanced Rock, Fiery Furnace-such placenames suggest the primitive spirit and wild desert beauty of this vast wilderness of rock. 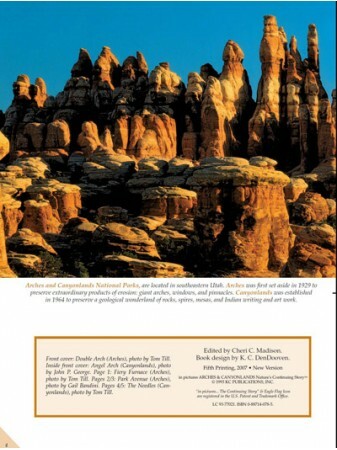 9x12, Paperback, 48 pages, 77 color photos & 2 maps. 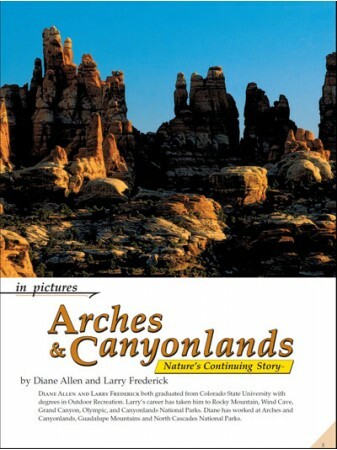 Two dramatic Parks – a basic story of rocks being formed and then eroded into spectacular shapes and vistas: Arches and Canyonlands National Parks. 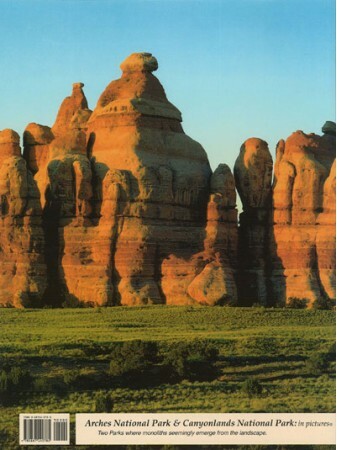 Here for us to see, travel into and enjoy are landform sequences that tell a story of how much of America’s Southwest was formed. In such desert-like country it seems hard to think that the ocean from the west once laid down sand in staggering layers. Thousands and thousands of feet of sand, all to be converted into rock. 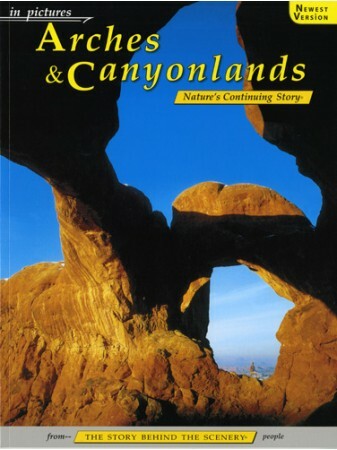 Yet we can see it plainly in the canyon walls – just like a book – like in this book! Then the bending and folding and slicing and the erosion began. It is a complex story. Still it is laid out for us to see as we travel through both Parks. It’s like traveling through geologic time. 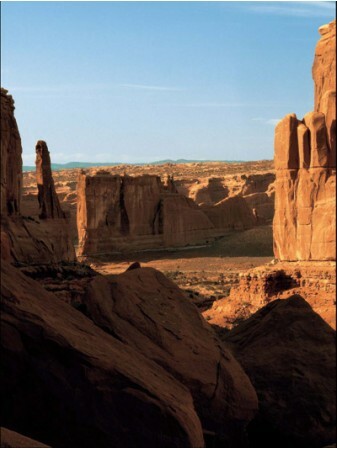 There is so much to see and explore in these two Parks. 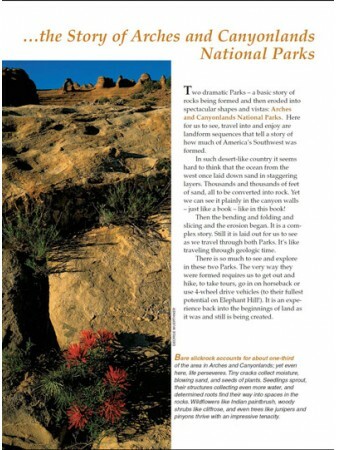 The very way they were formed requires us to get out and hike, to take tours, go in on horseback or use 4-wheel drive vehicles (to their fullest potential on Elephant Hill!). 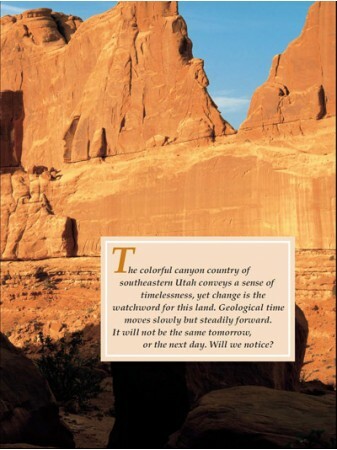 It is an experience back into the beginnings of land as it was and still is being created. Glancing down to below the towering formations we see that even from this seemingly dry land of rock, life does emerge in plants, flowers even trees. The early native people lived off this land. They left symbols and rock-writing to tell future travelers where they were, where to go, and tales about their ways of life. Today we need to preserve the balance of Nature. Welcome to this diverse land. 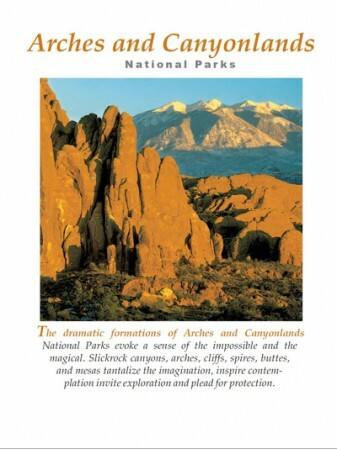 Come see and enjoy – but in a reasonable manner so that others can experience this land of standing rocks in the future as much as we do today. Here is scenery to both enjoy and learn from, a balance of life, in harmony with itself.